Hey everybody! Remember to check out the new website! Introducing the latest series of Drizzlescapes, my tribute to Abraham Lincoln! (right) "Tall Lincoln" - My first in the 'Lincoln' series is this 12" wide by 36" tall Drizzlescape. 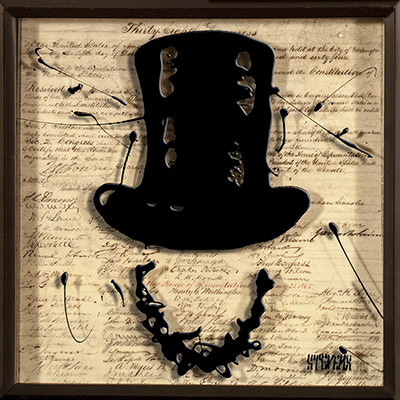 The foremost layer includes the iconic stovepipe hat and Lincoln's signature. 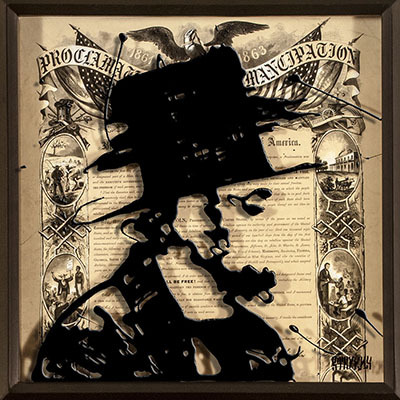 The middle layer is the drizzled profile of the man himself and all of this is suspended over a background of weathered and distressed documents including the 'Gettysburg Address', the 'Emancipation Proclamation', and the '13th Ammendment'. This one of a kind, original, three dimensional, framed painting runs $750 and for Newsletter Subscribers only, I will include shipping to anywhere in the continental U.S. (a savings of $75-$160). Act fast however, as these are going on display this weekend at the Scottsdale Art Festival! (above) "Lincoln Profile #1" - This is the first of three smaller (12"x12") Drizzlescapes of Mr. Lincoln. 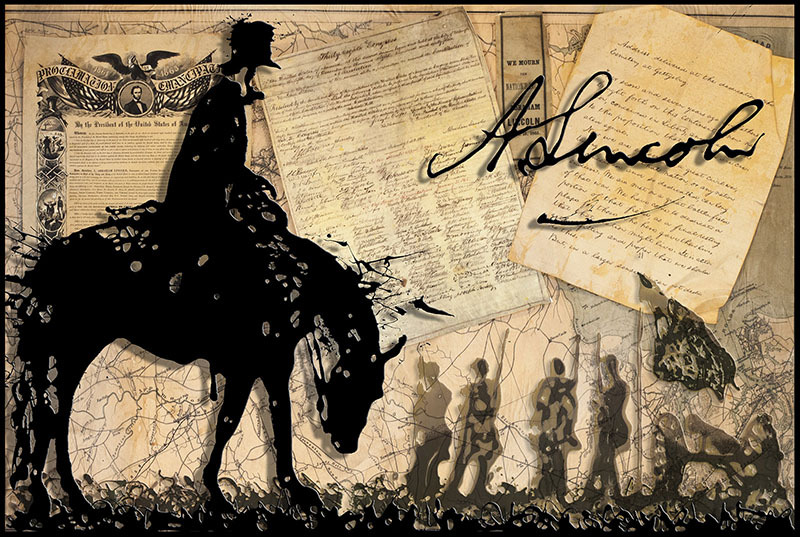 This first one includes his profile suspended over a weathered print of the Emancipation Proclamation. These affordable Drizzlescapes run $150. See the other two closer to the bottom of this newsletter. (below) "Lincoln Surveys" - 24"x36" Drizzlescape. For this one, I chose to portray Abraham Lincoln on horseback, surveying the aftermath of a recent battle during the tragic American Civil War on the topmost layer of clear acrylic. For the soldiers and cannon of the middle layer I drizzled transluscent enamels to give them a ghostly appearance. Even more than most of the Drizzlescapes, this two dimensional photographic representation does not do the original piece justice. In person, the depth and dimension of these pieces really comes to life! I absolutely love this piece, which runs $1,500 and again includes free shipping for Newsletter Subscribers! (below - below) The 2nd and 3rd 12"x12" Lincoln Profile Drizzlescapes. 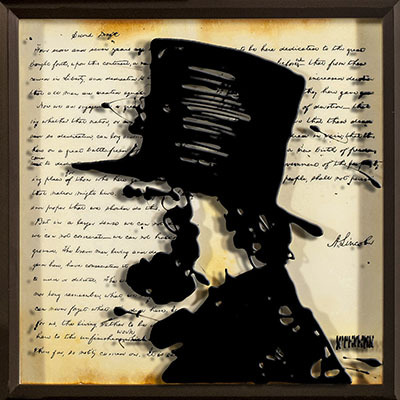 for these, I chose to suspend the instantly recognizable silhouettes over antiqued and distressed versions of the 13th Ammendment and Lincoln's famous Gettysburg Address. Check out the website - www.drizzlescapes.com - and pick your favorites! Meanwhile, I'm still in perpetual fund-raising mode for our film project, "Learning to Drive" and you can click on the link below to make a donation. Some folks have had some trouble with the link, so just please toss me a note and I'll direct you to some alternative links and methods for making a fully tax-deductible donation! We are still short funds to finish getting the 35mm motion picture film footage processed and transferred to a digital format for editing.